Feel like some ice cream tonight? If you head over to Baskin-Robbins Wednesday night, you can get a scoop of any of their 31 flavors for just 31 cents. 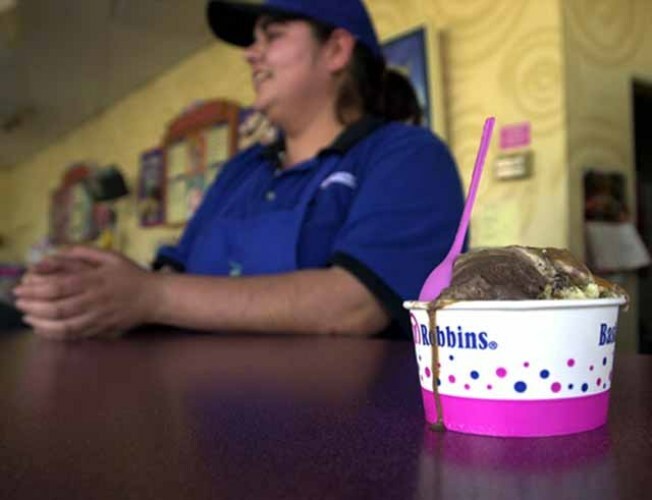 The offer is good on a small scoop from 5 p.m. to 10 p.m. at all Baskin-Robbins shops and there’s no catch. You get a cheap dish or cone of ice cream and Baskin-Robbins will donate $100,000 to the National Volunteer Fire Council’s National Junior Firefighter Program, which educates youths about the vital, life-saving work of volunteer emergency service members to ensure there are future firefighters to keep our communities safe. If you’re in New Canaan, the Baskin-Robbins at 103 Main St. is also offering pizza slices from Joe’s Pizzeria for 31 cents. The Bank of New Canaan Fire will hand out 400 piggy banks with 31 cents inside. At some locations in Connecticut, local fire charities will also benefit. The New Canaan Fire Department will hold a boot collection for the Mikey Czech Foundation, in memory of New Canaan resident Michael Czech, who died of cancer last year at age 11. In West Hartford, members of the fire department will be at the store on New Britain Avenue and there will be games, contests and prizes for the children and a whole lot of ice cream and coffee.